Description: DIVIDE THE CLASS INTO 6 TEAMS. EACH TEAM WILL CHALLENGE EACH OTHER, TO SEE WHO KNOWS THE MOST ABOUT DR. SEUSS. EVERY TEAM HAS A CHANCE TO EARN POINTS ON EACH QUESTION. TEAMS MUST WRITE DOWN THEIR ANSWER AND RUN IT TO A DESIGNATED SPOT BEFORE TIME RUNS OUT IN ORDER TO RECEIVE POINTS FOR THAT QUESTION. Click here (answers here) or here for some Dr. Seuss Trivia. 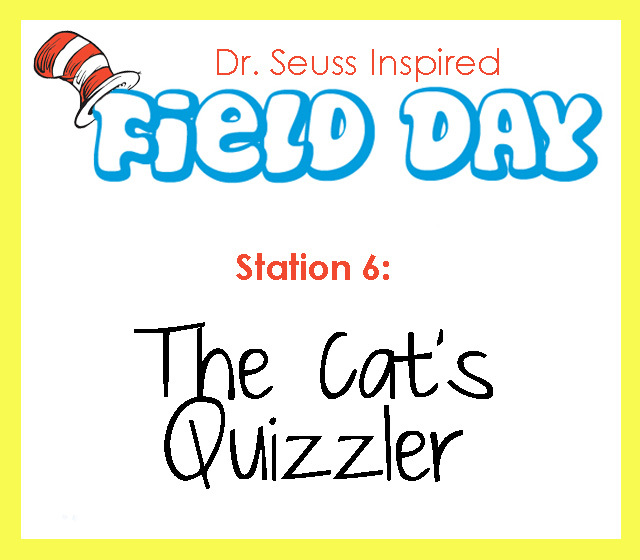 This entry was posted in End of the Year, Games, PE & Health, Reading and tagged Children, Dr. Seuss, Education, Elementary School, field day, Games, Kids, Teacher Resources, Teachers, Teaching, trivia by Squarehead Teachers. Bookmark the permalink.